The New York City General Assembly — the decision-making body for the “Occupy Wall Street” protest in lower Manhattan — approved a statement of purpose on Friday amid concerns that the movement lacked a clear message. 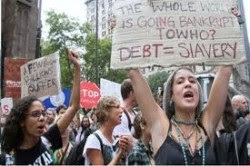 As corporations enjoy near record profits and Americans face staggering unemployment, protesters have pledged to occupy Wall Street in lower Manhattan until something is done about corporate greed and the influence of the wealthy on American politics. The protesters have been camped out in New York’s old Liberty Plaza, now called Zuccotti Park, since September 17. The NYC General Assembly describes itself as a “horizontal, autonomous, leaderless, modified-consensus-based system.” The body tries to achieve the most agreement possible and prioritizes under-represented groups. The general assembly keeps track of its meetings on its website. The New York Times had described the protest as a “noble but fractured and airy movement of rightly frustrated young people” whose purpose was “virtually impossible to decipher.” Other media outlets repeated the criticism that the protest had no specific purpose or demands. Many progressive and liberal groups did not initially embrace the protest but that changed after alarge coalition of unions and liberal groups announced their support for the “Occupy Wall Street” protest more than a week after it began. The protest has slowly spread to other cities, including Chicago, Lexington, Los Angeles, Denver, Boston, Seattle and more.